She blinded me with science: the LaWS installed on the USS DEWEY. We may not have servant robots or flying cars, but it America is finally ready to deploy functional lasers. 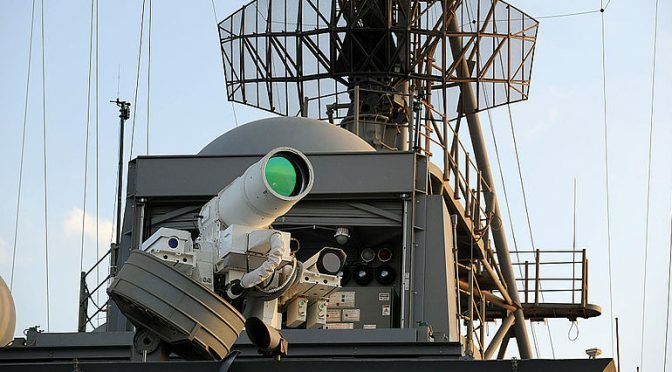 Next year, the USS PONCE will receive the military’s first field-ready Laser Weapon System (LaWS). The navy, and nation, are justifiably excited to finally embrace military laser technology. However, it is important for us to realize the tactical and technological limitations of our new system before rushing too quickly to rely on them too often. Lasers still face great challenges from the weather, ability to detect hits, and power demands. Lasers are nothing more than light: deadly, deadly light. Like all light, lasers as at the mercy of the atmospheric conditions they encounter. In particular, lasers are at the mercy of refraction and scattering. Refraction changes the angle that occurs as light moves through an atmosphere of varying density and makeup. As lasers are designed for longer ranges, or short range lasers encounter areas of differing conditions, the trajectory will change. This could pose challenges as targets move through areas of varying range and atmospheric density over long ranges. Fog and house music, LaWS’ greatest enemy. Laser light weakens over distance. Navigation types know this as “nominal range,” the range at which light can be seen in perfect conditions. A military laser’s effective destructive range is shorter, but the concepts are the same. “Luminous range” is the actual range of light due to atmospheric conditions. That range can be shortened by scattering caused by atmospheric conditions or precipitation. Lasers will be affected by such conditions as well, their effectiveness ranges shrinking in fog, rain, snow, etc… Depending how far the navy is willing to rely on laser technology, this could pose significant challenges to a fleet more beholden to the weather than before. Unlike kinetic rounds, lasers cannot be tracked en route to their target. An SM-2 explosion can be detected, the 76MM’s MK 98 tracks each splash and can be corrected by operators, and the CIWS system tracks each CIWS round for automatic ballistic correction. The refraction and scattering effects, combined with the time needed for LaWS to be effective, make judging effectiveness particularly important. The laser is not powerful enough to cause immediate destruction of target detectable by radar. If atmospheric interference prevents an IR tracker from detecting the laser heat signature on target, there is no way to verify trajectory and correct. This imposes, at times, a dangerous “wait and see” aspect to the use of LaWS. If a ship is engaging multiple C-802’s, and a LaWS has (hypothetically) range of 6nm, 37 seconds is not a long time for a ship to worry if its measures are effective. Enough power for a small city… or an array of space-age weaponry. Missiles and guns come with the kinetic energy stored either in fuel or a charge; 100% of a laser’s power is drawn from the ship’s power supply. This means greater demands from the ship’s grid, as well as a greater scope of variation on grid demand as a laser powers up and down. This pumping of massive demand could cause problems for EOOW’s trying to maintain plant stability. Lasers will naturally require either vast changes in plant layout to support greater power production, or a collection of either batteries or capacitors to act as a buffer for the fluctuations in power demands. There is also the possibility of adding nuclear-powered defensive laser batteries to our mostly defenseless carriers, especially if they were allowed to increase their power output. What some are starting to call the “most expensive fleet auxiliary” will gain a invaluable punch for self-defense and defense of ships in company. For lasers to be effective, the projected power “magazine depth” under real combat conditions will need to be determined and supported. As Peter A. Morrision, program officer for ONR’s Sold-State Laser Technology Maturation Program has said, “the future is here.” Before calling the, “all clear,” on this future, the navy should properly clear the room. Laser technology has amazing cost savings and lethal possibilities, but still has serious weaknesses in weather susceptibility, verification of hits, and power demands that need solving. Other shadowy possibilities exist, such as enemies employing laser-reflective coatings that would require lasers to change wavelength to increase effectiveness. As the technology stands now, it is a worthy display of American technological supremacy that saves money on CIWS rounds and SM-2’s for limited instances. For the technology to truly carry the battles, it must be far more powerful and far better supported by ship-board systems.